After the flack that the Grammys received last year, the award show seems to have gotten back on its feet. Not only were there more women nominated than men this year, but it also saw an incredibly inspiring speech by some of the most celebrated women in the industry today. Host Alicia Keys brought on 'sisters', Lady Gaga, Jennifer Lopez, Michelle Obama, Jada Pinkett-Smith for the opening segment of the show. They shared what music meant to them, driving the internet to the brink of insanity. And it's already a night to remember. 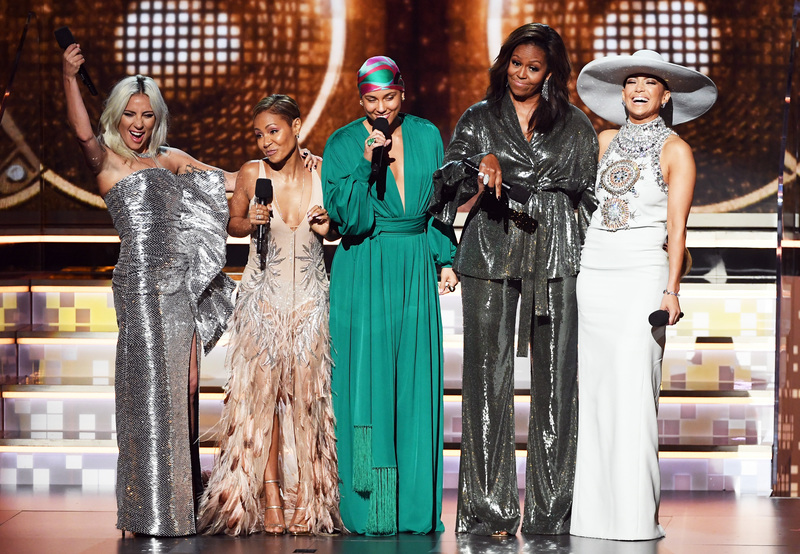 (L-R) Lady Gaga, Jada Pinkett Smith, Alicia Keys, Michelle Obama, and Jennifer Lopez speak onstage during the 61st Annual GRAMMY Awards at Staples Center on February 10, 2019 in Los Angeles, California. "Music has always been the one place we can all feel truly free," Gaga said, recalling how she was once labeled "weird" when she first found the spotlight in the industry. Gaga, who was also the first winner of the night for her track 'Shallow' with Bradley Cooper, weighed in on mental health as well in a speech later. "If you see somebody that's hurting, don't look away. And if you're hurting, even though it might be hard, try to find that bravery within yourself to dive deep and go tell somebody," she said sobbing, overcome by emotion. Jada Pinkett Smith said, "Every voice we hear deserves to be honored and respected. "From the Motown records, I wore out from the southside… music has always helped me tell my story and I know that’s true for everybody here, whether we like country or rap or rock. Music helps us share ourselves, our hopes and joys… to invite each other in. Music shows that it all matters, with every story, with a different voice… is that right, ladies?" Michelle Obama added as the crowd cheered. "Tonight we celebrate the greatest in each other, through all of us, through music,” Keys said before asking, "Who runs the world?" and the crowd cheered with "Girls!" Or in the case of the Grammys, these five powerful women! Twitter was flooded with appreciation for the gang.